Fiercely independent musician Lori Goldston will join some frequent musical collaborators to play live scores — all written by Goldston — to accompany three silent films May 11-13 at Base, the multipurpose space in Seattle’s Georgetown neighborhood. Seated near her amplified cello in the sanctuary of an acoustically superb North Seattle church, Lori Goldston describes a recurring dream. For Goldston, 55, a mesmerizing and fiercely independent musician who eschews traditional symphonic and chamber-music ensembles, the house-in-a-house dream also speaks to a creative restlessness. She’s on a long journey — but perhaps with no arrival. What a journey it’s been, though, one that will lead her to three special, if challenging, performances May 11-13 at Base, the multipurpose space in Seattle’s Georgetown neighborhood. Goldston and some of her frequent musical collaborators will play live scores, all written by Goldston, accompanying screenings of three silent-film classics: Robert J. Flaherty’s 1934 visceral quasi-documentary “Man of Aran” (Friday, May 11); Charles Bryant’s 1923 eerie “Salome” (Saturday, May 12); and Carl Theodore Dreyer’s 1928 astonishing “The Passion of Joan of Arc,” with its trance-like lead performance by Maria Falconetti (Sunday, May 13). Film scoring is just one strand in the dense weave of Goldston’s varied career. Widely known for playing with grunge-rock-era legend Nirvana on its 1993-94 tour (she performed haunting, sometimes devastating counter-melodies taught to her by Kurt Cobain), Goldston has since thrived in less conspicuous circles of protean creativity. She can typically be found with an array of like-minded Northwest musicians, performing and recording improvisational or experimental sounds. But she has also ventured into solo recording in recent years, with often breathtaking results. Goldston’s 2014 “creekside: solo cello” contains original tracks of sculpted, expressionistic drama. Leaping anarchically from less-is-more minimalism to anguished cries to kaleidoscopic, trippy distortion, “creekside” is a heightened experience of passion and immediacy. For Goldston, the album is a “love letter” to the field recordings of legendary Folkways Records — a major influence on her — with their ethos of capturing both a performance and its surroundings. Sitting with Goldston in that church, it’s impossible not to be seized by the weighty lyricism of her amplified cello as she plays it. As Goldston grabs her bow and locks into an explosive, sonic mix of drone, wail and unhinged rapture, the Hendrix influence (she listened to his music a lot growing up) arises. But so do many of her jazz favorites: John Coltrane, Don Cherry, Albert Ayler among them. Goldston later played cello in her school’s orchestra, taking private lessons on the side. Learning to play jazz guitar while absorbing folk and world music on Folkways — plus listening to more and more rock — the foundation of her intuitive approach to cello was forming. Continuing her music studies at Vermont’s Bennington College, a restive Goldston dropped out before graduating. Goldston moved on impulse to Seattle in 1986. It took time to find her footing in the Northwest music scene, but eventually she became a co-founder of several notable bands. One was the Black Cat Orchestra, a somewhat eccentric mix of instruments causing Goldston to go “on a wild-goose chase” to find applicable repertoire. Next came Spectratone International, formed with Goldston’s accordionist husband, Kyle Hanson. Among the group’s high points was a 2007 album, “Share This Place: Stories and Observations,” a collaboration with singer-songwriter Mirah. Perhaps best described as children’s music about bugs as imagined by Tim Burton (“Beetlejuice”), “Share This Place” makes for offbeat and intriguing fun. One day, Goldston’s phone rang, and Nirvana bassist Krist Novoselic invited her to hop aboard the band’s tour bus. Many people saw Goldston provide sometimes grave, haunting accents to Nirvana’s acoustic concert in a landmark “MTV Unplugged” broadcast. Goldston says the visibility and overall experience with Nirvana put her “on the map” as a musician, even if it was an anomaly on her path. Goldston did accept an opportunity last year to be the soloist in a cello concerto with the BBC Scottish Symphony Orchestra. The sight of her seated with the full orchestra in front of a concert-hall audience was jarring. 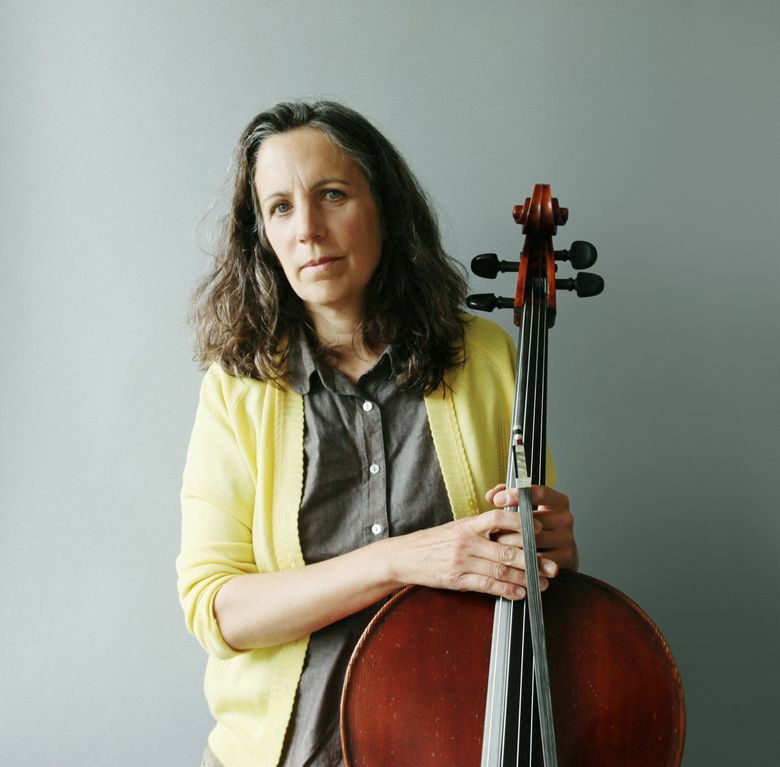 But the world-premiere piece they played, “That Sunrise,” with its wavy, all-over-the-map strings surrounding Goldston’s pensive cello, was written by her and commissioned by conductor Ilan Volkov. Goldston’s 2013 album “Film Scores” gathers some of her original music for films, including scores written for Yasujiro Ozu’s 1933 “Passing Fancy” and Dreyer’s “The Passion of Joan of Arc.” Two other tracks from her dynamic compositions were written for short documentaries by the very talented Vanessa Renwick: “Mighty Tacoma” and “Charismatic Megafauna,” the latter a startling work about wolves and humans. The post-Nirvana Goldston should be better known in her adopted Seattle, considering how ubiquitous she is in the city’s arts life. But she’s the first to admit dedicated self-promotion isn’t nearly as interesting as playing, or being a mom to 14-year-old son Isaac, a flutist. Tom Keogh: tomwkeogh@gmail.com. This report is supported, in part, by the Rubin Institute for Music Criticism, San Francisco Conservatory of Music, and the Ann and Gordon Getty Foundation.